Welcome to another week of our Summer Tournament Roundup. With the first week of the main tournament completed teams have now received their first batch of points and a place in the Championship Table. 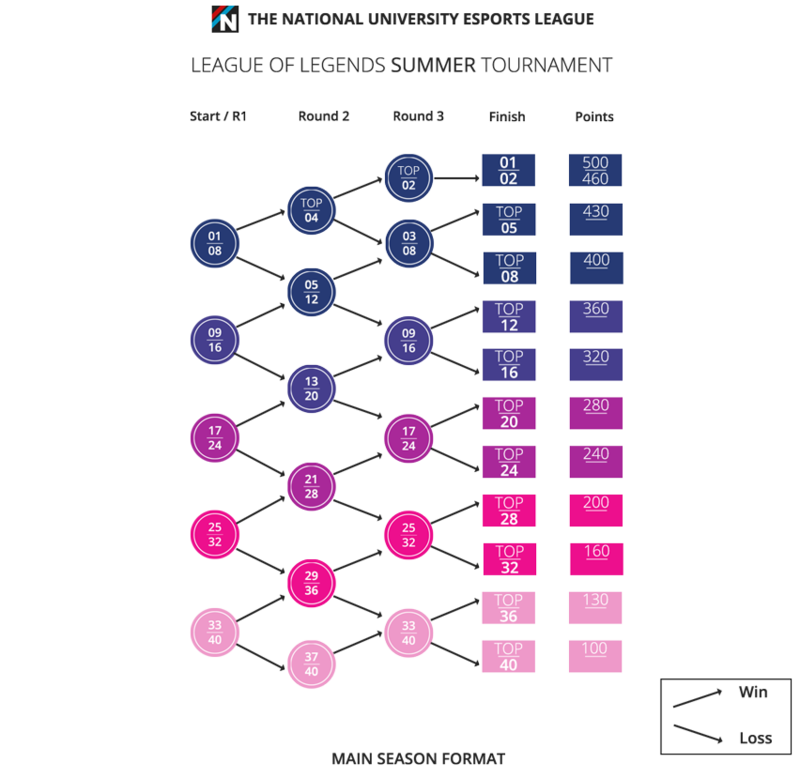 The main tournament format is similar to the qualification format with winning teams moving up and losing teams moving down. There are 3 matches each week with Championship Points awarded after each Sunday of matches. You can find an infographic to explain everything excellently here. Without further ado, let’s see which teams came out on top this week. Since this is the first week of the main tournament, the winners match the actual Championship Table. This week I’ve calculated these using the starting and final positions of teams this week. Using each team’s starting position this week rather than finishing position last week allowed me to accommodate new teams joining and teams who didn’t check in. Honourable mention has to go to Amir is Toxic from Birmingham City University. They are new to the Summer Tournament this week and climbed 13 places from their initial placement, the only reason they aren’t at the top of this list is because they didn’t participate last week. 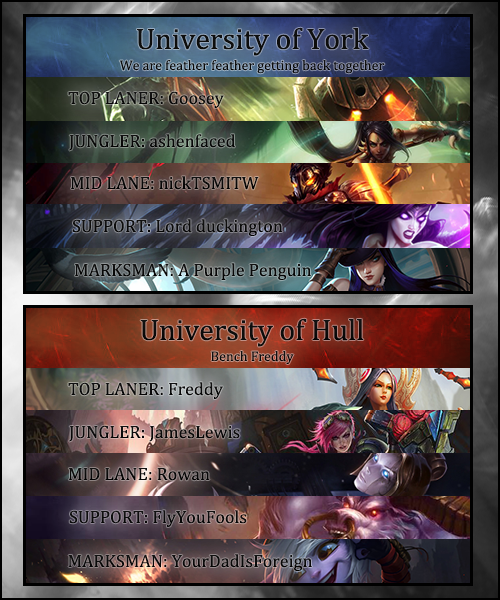 Our featured match this week features the first game on the stream, York vs Hull. Of the three games on stream this was the closest. The game started off with standard lanes without any sort of invade. Lanes looked very even for the first few minutes, the only sort of imbalance was that Goosey on Nautilus constantly had Freddy on Irelia pushed up to her turret and harassed. This soon led to first blood as ashenfaced on Nidalee ganked to kill the low health Irelia. There was an instant response in bot lane however, a close trade had left Lord Duckington on Caitlyn backing with low health under turret when JamesLewis on Vi ganked for an easy tower-dive kill. The bot lane duo of FlyYouFools on Tristana and YourDadIsForiegn on Alistar followed up to try for a second kill on A Purple Penguin’s Morgana. They succeeded however Tristana was hit by a Dark Binding while tanking the turret and died as well. The overall score was now 2-2 and the game remained even. For the next 15 minutes or so Hull slowly accrued a kill lead but York’s objective play meant it didn’t lead to much of a gold lead. nickTSMITW on Viktor overextended and died to a Vi gank at 9 minutes. At 11 minutes Hull’s bot lane recalled giving York a free dragon. At 14 minutes Hull’s top turret and York’s bot turret went down. But Hull got two kills shortly afterwards on an overextended Nautilus top lane and a Nidalee trying to tower dive bot lane. 15 minutes into the game Hull caught Morgana in her own bot jungle as a group and picked up the kill while most of her team weren’t in a position to respond. Hull now had a 1k gold lead. At 17 minutes the dragon spawned again. Hull started it but York are looking to contest. However they made a mistake and didn’t commit to it but still stuck around regardless. As a result instantly after it went down Hull engaged on them resulting in a 2 for 1 teamfight in Hull’s favour. The momentum was now well in Hull’s favour but they didn’t have much of a gold lead to show for it. Soon after York tried to make an objective-based play and nearly succeed. They pushed mid as 4 with Nidalee attempting to steal blue buff. For Hull to stop Nidalee they had to give up the low health turret, which is what they ended up doing. However it all went wrong when York tried to back out. Irelia, as an Orianna ball delivery system, got a Command: Shockwave on Caitlyn and Morgana for two easy kills and a mid lane turret in return. The gold lead grew to 3k, which still didn’t reflect the 4-13 kill scoreline. Hull started to focus on objectives rather than kills. The splitpushing Irelia picked up the top lane outer turret, while Vi solokills an overextended Caitlyn bot lane. York moved to stop Irelia pushing top lane but Hull rotated to stop them. The resulting fight gifted Hull 2 more kills and the second tier turret top lane. Now with a 6k lead it appeared to only be a question of how Hull would end the game. When dragon respawned they took it uncontested. Then they sprinted straight up the river to try for the baron. This time York did contest but lost 2 members in the resulting teamfight, though Hull didn’t get the baron. At 28 minutes Hull do get the baron, this as a result of catching out two York members in the top-side jungle from a baron bait. York had been on 4 kills for ages. A small Hull mistake gave them another one finally, though as comebacks go it wasn’t helpful. Hull sent Irelia to splitpush but the others failed to pressure another lane to keep her safe (they took another dragon instead). This let York collapse on her bot lane for the kill. Hull tried again with the Irelia splitpush at 34 minutes. While she splitpushed the rest of the team pushed top lane. York attempted to collapse on Irelia regardless, but left an escape route open. Irelia ran through the York base to escape safely to her team. Meanwhile the rest of the Hull team had been pushing and immediately afterwards took down the inhibitor turret top lane before engaging a teamfight. Hull won the teamfight with 3 kills and none returned then took the nexus to win the match!